Scoop is the slightest of comedies from writer/director Woody Allen, and though still a long way from the quality of films he made in his glory days, it is nevertheless eminently watchable and consistently entertaining. His 41st directorial effort continues the upward trajectory he started with Melinda and Melinda and Match Point, and Scoop actually serves as the lighthearted flipside to the latter's dark plot of illicit affairs and crimes of passion. It retains some of that film's cynicism about human nature, but drops it into the center of an old-fashioned mystery plot. Mix that with some of Allen's cornball humor and charming cast, and you're just about to forget the man was ever in a slump. Scarlett Johannsson, Allen's latest muse, plays Sondra Pransky, a wide-eyed American journalism student spending her summer vacation in England with a well-to-do friend (Romola Garai, Dirty Dancing: Havana Nights). The girls go on a night out to see a magician, the Great Splendini, a.k.a. Sid Waterman (Allen). He's an old school magician, peddling card tricks with a vaudevillian flair. With each illusion--or as he calls them, "experiments"--Allen looks out to the audience with an expression that suggests he has as much trouble believing it worked as they might. It's a pleasant turn for the actor, slightly self-deprecating, as if he is old hat and knows it. Of course, Sid picks Sondra for his grand finale: making a woman disappear. Only, once she is in his magic box, she is met with an invading presence, the spirit of recently deceased investigative reporter Joe Strombel (Deadwood's Ian McShane). On his way to the Netherworld, Joe was given a tip that his reporter's brain can't let go, so he has jumped ship (literally) and swam back through the River Styx to tell the first reporter he meets. That just happens to be Sondra. 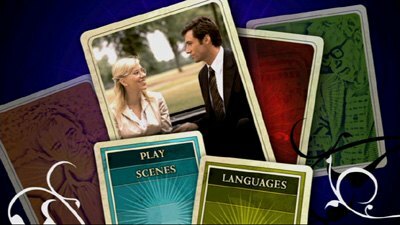 Joe puts her on the trail of Peter Lyman (Hugh Jackman, The Prestige), the wealthy son of a Lord that Joe has learned may be the elusive Tarot Card Killer. If it's true, he has just handed Sondra the scoop of a lifetime. Only Sondra isn't necessarily cut out to be a reporter. Her first career path was to be a dental hygienist, and from this our humor springs. Posing as father and daughter, Sondra and Sid wheedle their way into Lyman's world. Naturally, Sondra's feminine qualities draw the attention of Peter, and the sophisticated Don Juan lures in the girl who is determined to lock him up for murder. Much of the black humor of Scoop has a Hitchcockian wink to it, and even if there are no grisly onscreen murders or any palpable sense of menace, Woody borrows some good plot twists from Hitch, as well. The result is a movie that manages to surprise even though the plot is remarkably free of complicated business. It's breezy and full of wit and possessed of an eccentric bend that it is quintessential Woody Allen. 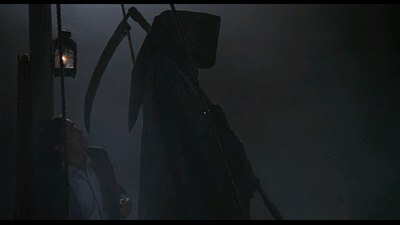 What other light comedy would feature two scenes on the ferry of the damned, complete with a hooded Grim Reaper? Scoop plays like a movie that was made simply to provide the audience with a good time, and on that front, it's a smashing success. Presented in 1.85:1 anamorphic widescreen, Scoop generally has a very strong picture quality. In a couple of scenes with lots of hot colors, like the very red stage set for Splendini, I did see some wavy lines in the background, but those moments quickly passed. Overly nitpicky to even note it, really. A nicely mixed 2.0 mix. The musical score is largely known orchestral pieces, and they swell with power and have the appropriate effect on the viewer. There are English, Spanish, and French subtitle options. Scoop is a solid, entertaining effort from Woody Allen, and thus is Recommended. While not the equal of the director at his prime, it's still a harmless confection that passes the time nicely. A likable cast and a zippy script keep it from ever getting boring, and all the genre points Allen aims for--whodunit, romance, comedy--he hits. Simply put, Scoop is splendid.